Arthur WIlliam Redgate (1869-1906) - landscape and figure painter who exhibited between 1860-1906. He was a member of the Nottinghamshire Society of Artists from 1881 and lived in Nottingham from 1880. 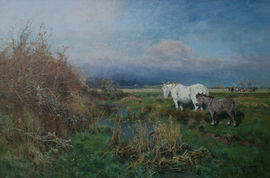 Redgate was a respected British landscape painter of the late 19th century.